Germany: Give them a pig and some cabbage, and they'll make you a meal. Germany is sometimes closer than you think. Last week on the verge of a mental breakdown, and threatening bodily harm if I spent a single moment more in the South, I rented a car and drove north. Since I could not afford the airplane ticket back to Europe, I decided to make the best of it by visiting German Village in Columbus Ohio. It's a quaint and cute neighborhood of small awkward houses built by German immigrants over 100 years ago. The roads are still (mostly) cobblestone, and the village is arranged around a single German restaurant (and sausage factory) called Schmidt's. 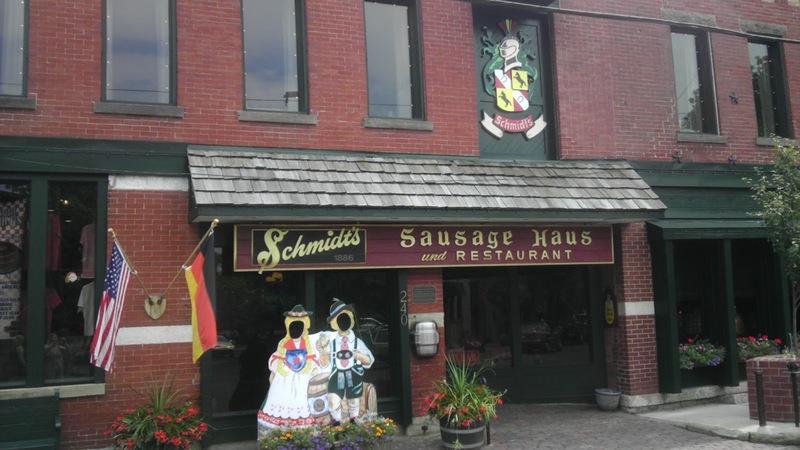 It's the existence of Schmidt's Haus that brings people to this tiny little German village, now over-run by modern yuppie home-owners who renovate their quaint European homes with air conditioning and aluminum siding. 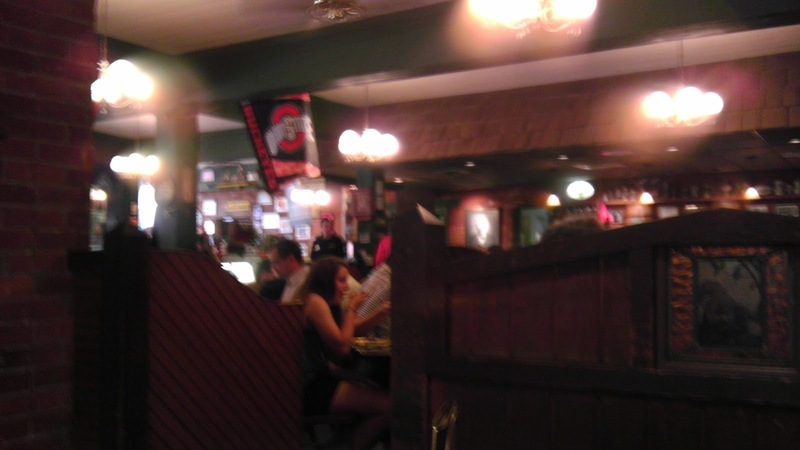 But Schmidt's look like a German themed restaurant, though tainted by tourism, and is unusually inviting considering its isolated location in Columbus. 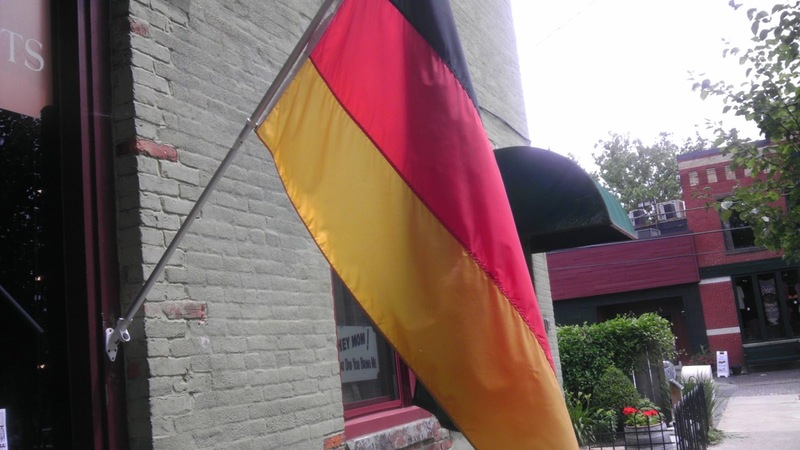 It's a five generation old restaurant that requires the wait-staff to wear silly dirndls (beer maiden dresses), and sells imported German beers. There's a sausage buffet for around $10 with their award winning Bahama Mama Sausages, sauerkraut, and corn-beef and cabbage. Shannon was amazed by the apple sauce, though it left us way too full to enjoy the deserts or fudge from the neighboring fudge factory. Any building that has a beer keg attached to the side of the building must be good. 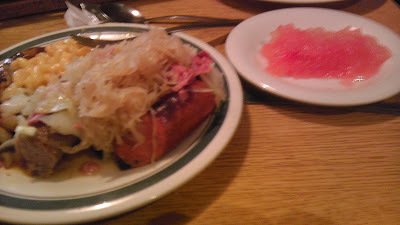 I will say this, the best sausage and kraut I ever had was in Krakow Poland, and I doubt I'll ever find anything like it Stateside, or even a recipe for how to make it like that (I continue to try though), however, Schmidt's makes for some great eats, and a good escape from America when you can't get to the real thing. Clearly Germans are Ohio State fans. Considering the fact that not every state has ethnically preserved cities and towns, and we tend to assimilate and forget our heritage, finding a restaurant and village that has not only retained some of its roots, but serves it up in a dress with a beer makes the perfect cure when you can't get back "home" to Germany instead.